Chinese President Hu Jintao has left the G8 summit in Italy to return to Beijing amid an outbreak of violence in the northwestern Xinjiang province, China's state-run Xinhua news agency reported early Wednesday. A woman shouts at Chinese security officers in the city of Urumqi on Tuesday. ((David Gray/Reuters)) Chinese President Hu Jintao has left the G8 summit in Italy to return to Beijing amid an outbreak of violence in the northwestern Xinjiang province, China's state-run Xinhua news agency reported early Wednesday. 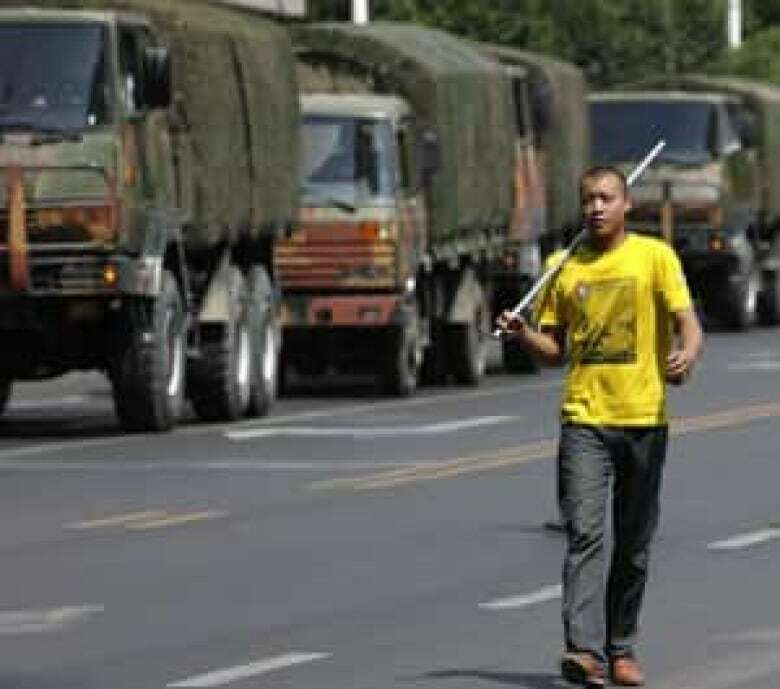 The move comes as officials in Xinjiang imposed a curfew overnight as part of a crackdown on protesters after Han Chinese clashed with Uighurs in the provincial capital on Tuesday. After bringing in riot police to break up multiple protests, the Xinjiang regional government announced that a curfew was to be imposed from 9 p.m. Tuesday to 8 a.m. Wednesday local time. The curfew is needed to "avoid further chaos," said Xinjiang Communist Party secretary Wang Lequan. 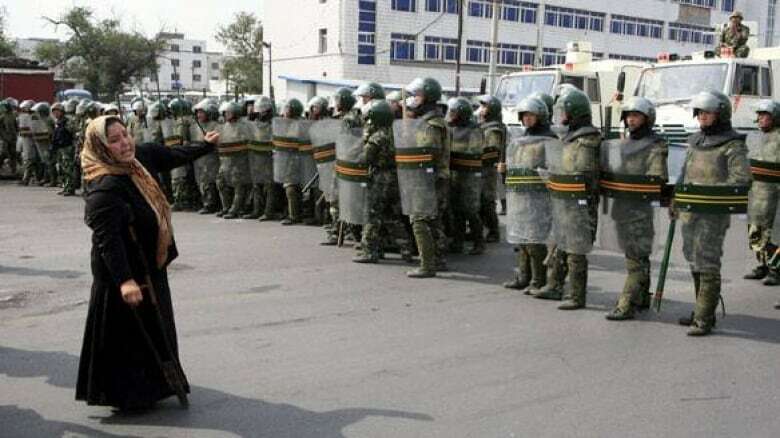 Riot police using loudspeakers appealed to about 300 marchers to stop their destructive behaviour as they threw rocks, smashed shop windows and knocked down food stalls run by ethnic Uighurs in Urumqi on Tuesday. Many of the protesters waved wooden sticks, pipes and shovels while chanting "Unite" and "Modern society," according to eyewitness accounts. "They attacked us. Now it's our turn to attack them," a man in the crowd told Reuters. As the demonstrators entered a predominantly Muslim area and approached a mosque, police used tear gas to break up the crowd. The Han march followed an earlier protest by about 200 people from the Uighur minority that resulted in a standoff with security forces and blocked a main road. At least 156 have died in ethnic violence in the northwestern province of Xinjiang since Sunday. UN High Commissioner for Human Rights Navi Pillay said an extraordinarily high number of people had been killed and injured in the rioting, and she called for a full inquiry. "I urge Uighur and Han civic leaders, and the Chinese authorities at all levels, to exercise great restraint so as not to spark further violence and loss of life," she said. "This is a major tragedy." The European Union on Tuesday called for "restraint on all sides," adding it "deplores the loss of life and expresses its sympathy with the families of the victims." Uighur expatriates also protested outside the Chinese embassies in Turkey and Norway on Tuesday. Protesters briefly scuffled with police in Ankara, and the Turkish Foreign Ministry summoned a top Chinese diplomat over the violence in China. In Oslo, at least two people were injured when roughly 100 Uighurs gathered outside the Chinese embassy. One received injuries while trying to scale the embassy fence. Protesters waved the Uighur national flag and shouted slogans such as "Stop killing our brothers — stop killing our sisters." The Uighurs — an ethnically Turkic, predominantly Muslim group — make up the majority in Xinjiang, a region in northwest China bordering Central Asia and Mongolia. The protests started in the provincial capital of Urumqi on Sunday, when demonstrators gathered to demand justice for two Uighurs killed in June during a fight with their Han co-workers at a factory in southern China. The protests turned into the deadliest ethnic unrest in the region in decades. Speaking at a rally in Washington on Tuesday, exiled Uighur leader Rebiya Kadeer blamed the Chinese government for the violence. About 100 people chanted "Shame on China" as they marched to the Chinese Embassy. Chinese officials have blamed Kadeer, who heads the Uighur American Association (UAA), for inciting violence. Kadeer, who has lived in Fairfax, Va., since she was exiled from China four years ago, denies the charges.